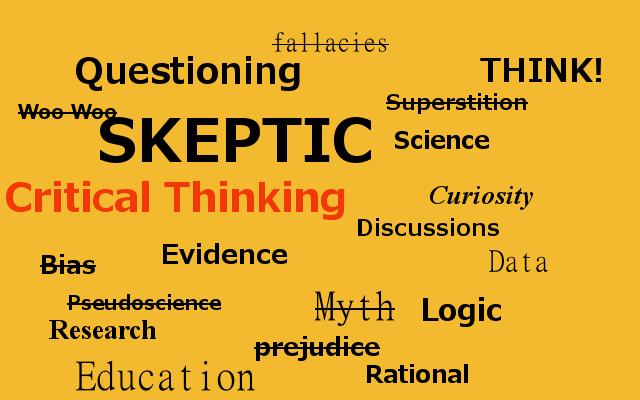 This blog is also about Skepticism. My friend, Kitty, publishes a blog the Yankee Skeptic. She publishes guest posts on occasion. In fact, she’s published a couple of my blogs on her site. She’s such a nice lady and kind to a fault. Most recently she posted a blog entry from one of her friends, Jon Claflin: Guest Post – Is the Modern Skeptical Movement Actually Necessary? If you click on the highlighted text, you should be directed to the Yankee Skeptic and the entry posted on April 13, 2014. According Jon’s bio, which he included at the end of his article, he’s a 51 year old self-taught Skeptic with a GED certificate and no college. He is an experienced comedy writer and currently working for an insurance company. He’s a Blues guitarist, Agnostic, a husband, father, and grandfather. Why would I mention his bio? Every day we are faced with new information and part of the process of critical thinking is to consider the source particularly when we are evaluating opinion and Jon’s article is an opinion piece. Each bit of information in the bio helps me decide how much value I should assign to the opinion. Nowhere in his bio or in his blog post is there any indication that Jon has attended any of the “modern Skeptic” activities that he denigrates. It’s clear that Jon doesn’t consider the positive aspects of the “modern Skeptical movement.” He specifically doesn’t appreciate the value of, “…boat cruises, political activists, glamorous dinner events, expensive hotel seminars, meet & greet events, paid lectures, pub meetings, and book tours.” Each and every one of these activities is useful and beneficial to promote skepticism. Boat Cruises allow very close interaction between amateur and professional Skeptics and they help fund organizations such as JREF (James Randi Education Foundation.) The JREF in turn provides resources for Skeptics and educational scholarships. The dinner events serve much the same purpose. They are fund raisers and a chance for interchanges of ideas. Seminars create an environment of camaraderie and allow educators, researchers, and those interested in improving their own critical thinking skills access to others working in a wide variety of disciplines. Lectures and book tours are the engine of the movement. Both get the information out directly to the public and people writing books need people to buy them. Jon didn’t use a single specific example. An example to illustrate my point, the JREF was instrumental in exposing the fraud that contributed to the death of hundreds of people in the Middle East. The ADE 650 was being sold as a bomb detecting device in Iraq. It was no more than a modified novelty toy that was supposed to find golf balls. It didn’t work as a golf ball finder and it didn’t indicate where explosives were planted but the promoter sold them by the hundreds, made millions, and led to the injury and death of hundreds of civilians and soldiers. The JREF brought together the scientists that tested the device in the California Desert to the politically connected Skeptical communicators and played a key role in ending that fraud and saved hundreds of people. Fraud charges were brought against the promoters and they have been sentenced to prison terms. Unfortunately, a patent for the fraudulent devices was issued recently in Romania. The pseudoscience “rubber ducks” keep returning to the surface and we need every tool at our disposal to get the word out. I’m not buying Jon’s argument. The Skeptical movement may have some problems but it isn’t hurting society and making it easier for the purveyors of pseudoscience. Program’s like the Myth Busters and Bill Nye the Science Guy are also part of the movement and they work across the board from the young to the old to make science and Skepticism fun and exciting. Penn and Teller’s BS program ran for 7 seasons and covered a lot of Skeptical ground. A program that runs that long shows the effort is being appreciated and that we’re better for the experience of being exposed to it. There is a lot more that I can say but this blog entry is already long. The bottom line is that Jon Claflin is entitled to his opinion but if he wants others to share his opinions, he has to make a more compelling case. He should continue on his effort to learn about Skepticism and truly educate himself on the basic mechanics of the process. If he can’t do it alone, there are groups such as JREF, the Skeptics Society, and local Skeptics Meetup.com groups that can help. This entry was posted in Skepticism and tagged Arguments, community, Logic, meeting, questions, Science, Skeptic, Skeptics of Tucson, tucson. Bookmark the permalink.